Funny title no? Can you guess where it came from? This is a really oddball sized card that will require a custom envelope and I’m ok with that. After watching a video on mixing Dylusions sprays with Dylusions white linen spray, just had to try the technique. You’ll find the video here on the Joggles site. What I love about this technique is that the deeply pigmented inks become chalky and beautiful pastel versions of themselves…very cool indeed! I’ve used Simon Says Stamp watercolor paper and created the mixes in three different colors; and then sprayed each one on my paper. Next I sprayed water through a template to do the ghosting effect and then added some more spray and some Distress Inks through additional templates. 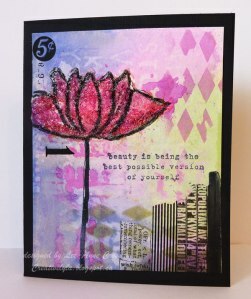 Then, I stamped the floral image and the sentiment in Ranger Jet Black Archival Ink. Next I “painted” the flower with glass bead gel and dried it. Since I really wanted the flower to stand out, I colored it with my Faber-Castell big brush pens to give it some rich color, then outlined the entire flower with my black big brush pen. In the lower right corner, I’ve added some washi tape, some of the Tim Holtz tissue tape, and a smudge of the black big brush pen. Then I used some of the Tim Holtz remnant rubs on the upper left quadrant of the page. This is so creative and so pretty, Lee-Anne. I will have to go to the Joggles site. O.K., the only Lucy's that come to mind are Lucille Ball and Lucy from Peanuts. A mixed media masterpiece! That flower is stunning!! I guess Benz and I must be pretty close in age since that is exactly where my mind went with your title. Ladies, you are both right and let's not talk age ok? LOL! It is indeed Lucy from Peanuts…I thought about her dispensing advice and her little 5 cent sign and if you look in the upper left corner…there it is.